Fuel costs are at such a high rate that many people find that a good portion of their paychecks are going either in their car's fuel tank or in their home for heat and other utilities. Fuel is needed almost everywhere we look, even if we don't realize it. Some of the simple things in our lives that we take for granted are controlled by our usage of fuel. Our home is the largest source of energy usage. 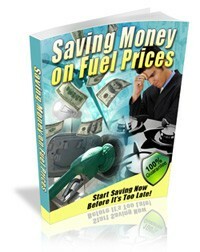 Saving money on fuel prices has become top priority to many homeowners. We may not have any control over the high price of fuel, but there are ways of saving money on fuel prices. With a little dedication and determination, you can make your home as energy efficient as possible. It seems like every time we turn around winter is once again upon us with, and with it, the high cost of heating. If your heating bill seems to be higher than you believe it should be or saving money on fuel prices seems difficult, it may be time to give your home an energy efficiency test to see if it's as efficient as it can be. You may have an energy audit done, but you can still do some tests yourself to determine if there are any leaks in your home where warm air may be escaping. The first place you can look for heat loss is the space under your front door. There may other spaces that you can't see such as where two different materials meet. Look at all your windows and door frames as well as by your siding and foundation. If you have any outside gas or electric service entrances, check these out for heat escaping. Most of our electronics like television, cables and telephones pass through holes in our walls so make sure there is not excess air escaping. You can check for small gaps in a couple of ways. At night, take a flashlight and shine over any spots where you feel there may be any gaps or holes. Have someone on the other side checking to see if they can see the light. If they can, there are some cracks or holes that need fixing. Another way to check is to shut your doors and windows on a sheet of paper. If you are able to pull the paper out without the paper ripping, you definitely have a leak. If you still think you may have some leaks, shut off your heat on a windy day. Make sure all your doors and windows are cold. Turn on any exhaust fans that will blow air outside the home. Walk passed any potential holes and draft spots holding an incense stick that's lit. If the smoke gets blown into the room or sucked out of the room, you have a draft somewhere. By doing these simple steps yourself, you'll be on your way to saving money on fuel prices.